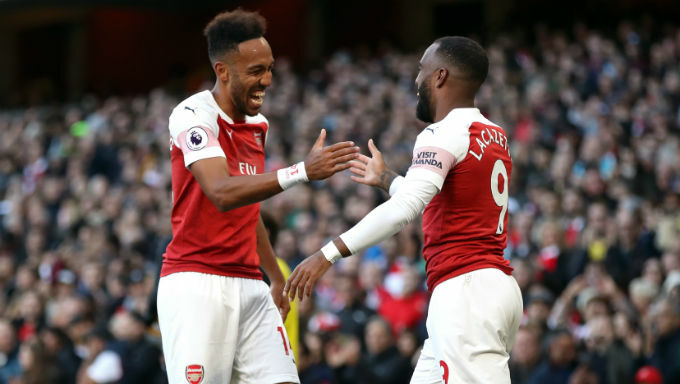 Arsenal’s Premier League season is beginning to take shape and they can leapfrog faltering Watford with victory over the Hornets at the Emirates on Saturday. Fourth-placed Watford had been the league’s surprise package in the early stages but have followed up four straight wins with a defeat and a draw in their last two outings and exited the League Cup at the hands of Tottenham on Wednesday night. By contrast, Arsenal have responded to back-to-back opening defeats with four league wins on the spin, six in all competitions, and Unai Emery’s side are odds-on (2/5 with Betfair) to make it five in a row in the Premier League. Not to put a dampener on Arsenal’s first clean sheet of Emery’s reign, but only for Petr Cech putting in a display reminiscent of his glory days at Chelsea, the Gunners may well have dropped more points at home to Everton. The 2-0 final score did not paint the whole picture, with Arsenal’s two-goal flurry coming against the run of play amid an inspired performance form their goalkeeper. Indeed, Everton managed 10 efforts at goal – more than the hosts – six of which hit the target. With Arsenal - whose second-string side built on the team's momentum via a 3-1 home win over Brentford on Wednesday - still conceding plenty of chances, visitors Watford look good value at 5/2 with Bet365 to score first, while Coral offer a massive 8/1 for the Hornets to be winning 1-0 at half-time, or 6/1 to be leading after 30 minutes. Troy Deeney has been a menace to the Gunners with two goals in his last three outings against them and will fancy his chances of adding to his streak. He’s 17/5 with Unibet to score at The Emirates while his team are 10/1 with Bet365 to score a penalty at any stage. For all Arsenal’s defensive woes, their attack is becoming more potent by the game, with Alexandre Lacazette and Pierre-Emerick Aubameyang having both scored in three of the past five matches in which they’ve featured together. As that scoring pattern begins to emerge and show promise, another has become almost too obvious to ignore – Lacazette’s love of playing in front of the Emirates crowd. Twelve of his 16 Premier League games have come at home, and the Frenchman is even-money (1/1) with 888Sport to score at any stage against Watford. After superbly curling in Arsenal’s opener in the win over Everton last time out in the Premier League and adding the third from the bench against Brentford, Lacazette’s confidence is clearly on the up. Those unconvinced about Watford breaking the deadlock should look to the Frenchman instead – he’s 18/5 with Unibet to score first. His partner Aubameyang has two Premier League goals to his name this term and looks a bigger threat with Lacazette on the same pitch. The Gabon international is 6/5 to score in an Arsenal win with Ladbrokes. Premier League betting enthusiasts may have noticed that both teams have scored in three of the last four meetings between these two sides and all signs point to another entertaining affair in Saturday’s 3pm kick-off. Arsenal average exactly two league goals per match from their opening six games, while Watford are operating just below that with an average of 1.83, per Opta Stats. In terms of conceding, the Hornets are averaging one goal per game while Arsenal are on 1.5. Furthermore, only two of the 12 Premier League games featuring these sides have produced a clean sheet this season, so it will buck the trend if both teams don’t find the net at some stage. Bet365 offer the best odds on that outcome, going 4/6 on BTTS.